++pitchsift and ++pvocloop have been updated to correct a bug which caused problems when loading the plugins in Ableton Live. ++pvocloop has also been updated to add glissando to the pitch control while being modulated. thanks to AB for reporting the bugs. registered users will be able to download the updated plugins from “checkout:customer account”. windows users should uninstall the previous version before installing 2.12.
version 9.12 of the free soundhack delay kit is now available for macOS and Windows. 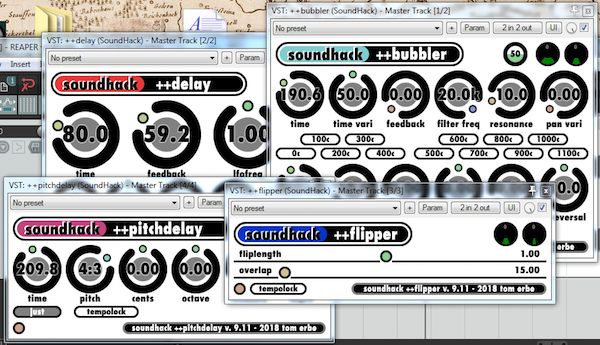 the bundle contains: ++flipper, for synchronized reverse delay; ++bubbler – an extremely flexible and MIDI playable granular delay; ++pitchdelay for old school multitap delay-based pitch-shifting; and ++delay – a fully featured 10 second delay, with extensive modulation and feedback filtering. this version of the bundle features updated compression and saturation algorithms in the feedback patch for more variety in high feedback delay processing. enjoy! bug fixes include a ++flipper AU authorization problem, and MIDI errors regarding octave recognition in ++bubbler and ++pitchdelay. thanks to ML for pointing out the MIDI bugs! 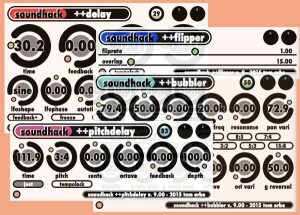 windows users should uninstall the previous version before installing 9.12.
the delay kit can be downloaded from the http://www.soundhack.com on the freeware page. 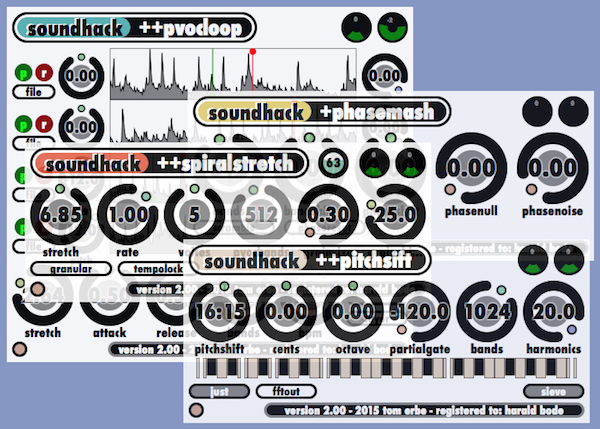 soundhack pvoc kit 2.11 is ready for macintosh in VST, AU and AAX; and windows in VST versions. download from the pvoc kit page. the bundle is priced at $85. the plugins have been given new names (a ‘+’ is added) as the parameters and curves are not compatible with the older plugins. many bugs have been fixed in this version, and copy protection has been removed. 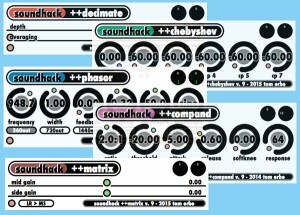 i have just finished new versions of the soundhack freesound bundle. please send any bug reports back to support@soundhack.com. the bundle consists of ++decimate: a bit crusher, ++chebyshev: a harsh distortion, ++compand: a compressor/expander, ++matrix: a mid-side encoder/decoder, and ++phasor: a multistage phase shifter. protools/aax versions can be purchased from the aax page. aax versions of the delay bundle (++delay, ++bubbler, ++pitchdelay, ++flipper) and the freesound bundle (++decimate, ++phasor, ++matrix, ++chebyshev, ++compand) are now available for macintosh from the aax page . the delay AAX bundle is $23, the freesound AAX bundle is $17. 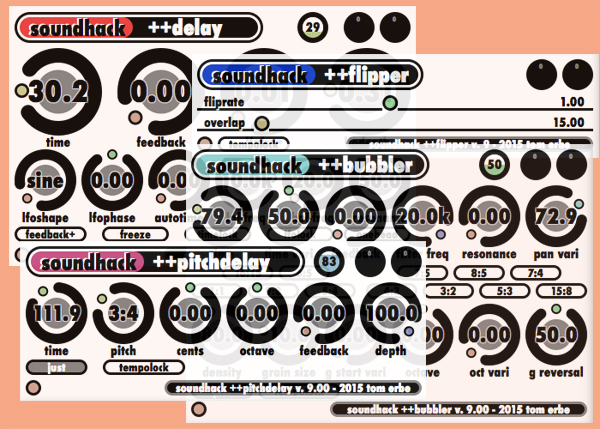 soundhack externals in 64 bit. 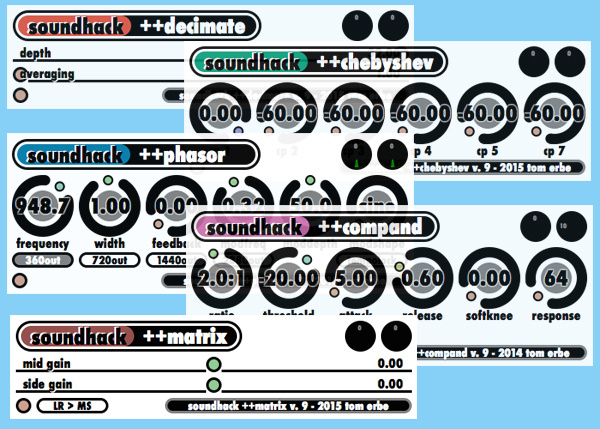 The Pure Data and Max/MSP SoundHack Externals have been updated to support 64bit on Macintosh. Download from the freeware page. 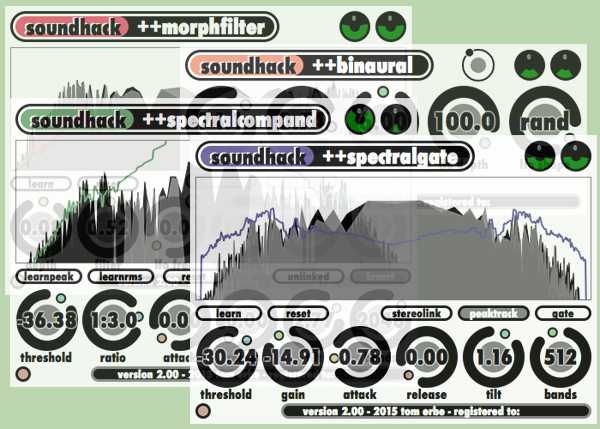 Posted in no category	| Comments Off on soundhack externals in 64 bit. For version 1.52 of Pvoc Kit, 1.51 of Spectral Shapers and 8.03 of Delay Trio/Freesound, Windows VST plugins are installed in C:\Program Files (x86)\Steinberg\Vstplugins and C:\Program Files\Common Files\VST2. SoundHack Spectral Shapers and Pvoc Kit are now being offered at a discount price to students and those who have purchased any of the Make Noise/SoundHack modules.